To Cite: Abderrahmane R, Benseddik K, Louhibi L, Zohra Moghtit F, Boubekeur A, et al. Basal Cell Carcinoma Risk and TP53 Arg72Pro Polymorphism: An Algerian Population Study, Int J Cancer Manag. 2018 ; 11(4):e11351. doi: 10.5812/ijcm.11351. Background: Basal cell carcinoma (BCC) is the commonest skin cancer in human. It is characterized by a strictly local malignity with a frequent tendency to relapse. BCC development results from the interaction between environmental factors and genetic alterations, including mutations in the TP53 gene involved in its progression and relapse. TP53 gene is named “guardian of the genome”, as it plays major roles in genomic stability. In addition to mutations, several polymorphisms had been detected in the wild-type TP53. The polymorphic variant is usually associated to BCC diseases at codon 72 of TP53 (Arg72Pro). Objectives: In the present study, we undertook a case control study to explore a possible association between TP53 Arg72Pro polymorphism and the predisposition to BCC in Northwest Algerian population. Methods: TP53 Arg72Pro polymorphism was investigated by PCR/RFLP then confirmed by DNA sequencing of 61 controls versus 50 BCC cases. Results: This study allows us to characterize BCC subgroups regarding age, tumor location, and relapse. No correlation was found between any of these criteria and each of the two variants of TP53 Arg72Pro. No association was found between TP53 Arg72Pro variants and developing BCC either (BCC group: Pro = 54%, versus Control group: Pro = 53 %, P > 0.05, OR 1.52 (0.89 - 2.60)). Finally, as expected, sun-exposure was confirmed as a risk factor for BCC. Conclusions: This study supports that analyzing TP53 Arg72Pro polymorphism is of no interest for identifying high-risk subjects for BCC in the Algerian population. Further studies are needed to explain the role of this polymorphism in genetic predisposition to BCC in some other populations. Basal cell carcinoma (BCC) is the most frequent skin cancer in human. It is characterized by a slow evolution and a strictly local malignity, with a frequent tendency to relapse. BCC is rare in childhood and youth, it occurs more often elderly between 45 and 60 years, and its incidence rates are reported to be higher for men (1). The most common form is the nodular ulcerative, generally affecting the head and the neck (2). BCC is a multi-factorial disease. It develops from the interaction between environmental factors and several genetic alterations (3). Studies have shown that mutations in the TP53 gene are involved in the progression and relapse of BCC and contribute to the adenoma-carcinoma transition (4). Alterations in tumor suppressor gene TP53 are the commonest genetic lesions in human cancers, discovered in more than 50% of whole cancers (5). In addition to mutations, several polymorphisms in the wild-type TP53 had been detected (6, 7). Polymorphisms introduce a significant change in the structure of the protein, especially when they occur in the proline-rich domain of p53, because this domain is required in inducing cell apoptosis (8). Diverse studies highlighted the role of p53 72Arg form in apoptosis induction, while the p53 72Pro form was implicated in the G1 arrest and in the DNA repair (9). During the evaluation conducted between 1996 and 2005, the cancer registry of Oran (Northwest of Algeria) noted that the BCC represented 54.3% of all skin tumors. Several studies reported TP53 Arg72Pro polymorphism, as a genetic predisposition factor for BCC. Depending on geographic localization and ethnicity, they introduced the Arg allele or Pro allele as the predisposing one (10, 11). This study meant to explore a possible association between this polymorphism and BCC in the population of Northwest of Algeria. We first, undertook a pioneer study to evaluate the frequency of this polymorphism in a control healthy group; then, we performed a case control study for the BCC. As its incidence rates are reported to be higher in men (1), our study was restricted to this gender. The patients group was constituted of 50 blood samples of sporadic patients with BCC from Northwest of Algeria, diagnosed at plastic surgery department of the University Hospital of Oran. Data of patients were gathered, including patient age at diagnosis, gender, and relapse. The control group was constituted of 61 blood samples of healthy blood donors, all men and originating from Northwest of Algeria. Informed consents were obtained from all participants. The local ethics committee judged the project ethically acceptable. Informed consent was obtained from all participants. All participants was volunteers. Genomic DNA was prepared from blood samples of patients and control groups, using a simple salting out procedure, as described by Miller et al. (12). The region of codon 72, was amplified by PCR, using primers F: 5’CGTTCTGGTAAGGACAAGGGTT3’ and R: 5’TCCATGAGACTTCAATGCCTGG3’. A total of 441 bp were obtained as product of amplification. 200 ng of DNA were used as template in a 25 µL PCR reaction mixture containing 1.5 µmol MgCl2, 2 µmol of primers, and 1 U Taq polymerase (Perkin Elmer Applied Biosystems, Weiterstadt, Germany). PCR cycling conditions were carried out with an initial denaturation step at 94°C for 5 minutes, followed by 30 cycles of 94°C for 30 seconds, 60°C for 30 seconds, and 72°C for 30 seconds. A final extension step was performed at 72°C for 5 minutes. Ten U of the endonuclease BtgI specifically cleaves the allele coding for Pro72, but not the one coding for Arg72. Cleaved PCR products resulted in 2 fragments of 235 and 206 bp corresponding to the Pro allele, and a fragment of 441 bp corresponding to the Arg allele. 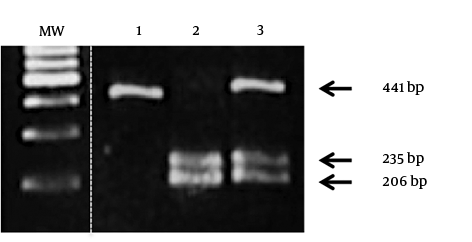 Fragments were analyzed on 1% agarose gel. Genotypes were, then, confirmed by sequencing the amplified fragments, using a capillary sequencer ABI 3130. Sequence analyze was performed, using software: “Seqscanner”, and “Multalin” (13). The statistical software “EpiInfo 5.01” package was used to crosscheck genotype frequencies by the χ2-test, with Hardy-Weinberg expectations. The significance level was set at P < 0.05. The age of onset was analyzed by the Kaplan-Meier method; then, ages of onset were compared between genotype groups, using the Log-rank test. The statistical software “GraphPad Prism 5” was used for these statistical data analyses. This study includes 50 patients with BCC and 61 cancer-free control men. The recorded data is summarized in Table 1. TP53 Arg72Pro polymorphism was analyzed by PCR/RFLP (Figure 1) and sequencing. Both of them were successfully conducted in all cases and controls. Figure 1. Restriction analysis of TP53 codon polymorphism. Lane 1, 2, and 3, samples showing homozygous profile for arginine, homozygous profile for proline, and heterozygous profile, respectively. MW: DNA molecular weight, 100 bp marker. The PCR product corresponding to the arginine allele was not cleaved by BtgI and had a length of 441 bp, the proline allele was cleaved by BtgI with two fragments of 235 bp and 206 bp. In the control group, the frequencies of Arg/Arg, Arg/Pro and Pro/Pro variants were 32.8%, 47.5% and 19.7%, respectively. Corresponding allelic frequencies were 56.6 for the Arg and 43.4 for the Pro. The statistical analyses revealed that the distribution of these 2 alleles in the Algerian population was close to those found in many other populations (Table 2). At first, considering that skin reactions to sunlight exposure significantly increase BCC risk; the sun-exposed areas were observed among photo-exposed subjects involved in high-risk professions (photo-exposed: farmers, field or construction workers, painters) (P = 0.02, OR 50.4 [11.3 - 224.1]), as compared to photo-protected subjects (P < 0.001, OR 0.02 [0 - 0.09]), who tended to have BCC on less-exposed areas. Photo-exposition was also correlated to a high-risk of relapse (P = 0.005, OR 18.2 [4.8 - 68.8]) (Table 3). Abbreviations: CI, confidence interval, OR, odds ratio. The distribution of Arg and Pro alleles in BCC group, as compared to their distribution in the control group, showed no significant difference (Table 4). In the BCC group, the distribution of 3 genotypes was as follows: 32% homozygous for Arg/Arg genotype, 28% heterozygous, and 40% homozygous for Pro/Pro genotype. Similarly, in the global comparison, there was no significant difference in age of onset between 3 genotypes (Log-rank P = 0 1236) (Figure 2). The median age of onset was 52 [25 - 68]: 50 years for the Arg/Arg patients, 53 years for the Arg/Pro patients, and 53.5 years for the Pro/Pro patients. Figure 2. Kaplan-Meier curves comparing age of onset of BCC according to TP53 Arg72Pro polymorphism status (three genotypes Arg/Arg, Pro/Arg, and Pro/Pro). The Log-rank was not statistically significant (P = 0.1236). Lastly, TP53 Arg72Pro polymorphism variants frequencies were neither significantly different for patients with BCC in sun-exposed areas (head/neck, limbs) as compared to patients with BCC in less-exposed areas (χ2 P = 0.79), nor correlated to relapse (χ2 P = 0.161) (Table 5). bP value from Chi-squared test. The present study explored, for the first time, the distribution of TP53 Arg72Pro polymorphism variants in Algerian population, more specifically in Algerian patients with BCC. As BCC incidence rates are reported to be higher among men (1), the current study was restricted to this gender. Since the RFLP method used for the detection of the TP53 Arg72Pro polymorphism could be a source of bias due to problem of partial enzyme digestion, we confirmed our result via DNA sequencing, a more accurate method. Sequencing showed 100 % rate of overlap. Several differences from previous studies should be pointed out; the Northwest-Algerian population is at Hardy-Weinberg equilibrium; Arg allele and Pro allele frequencies are close. Since the TP53 Arg72Pro polymorphism was identified (14); and for most of populations tested to date; Arg allele seemed to be the most common allele, and Pro allele seemed to be the rare one. Like for Tunisian (15); European (16); and Japanese (17), with some exceptions like for black African and African-American (18, 19) and for central Chinese population (20). The results of this study show no association between TP53 Arg72Pro polymorphism variants and the risk of developing BCC in this population. Many studies have explored the effect of the TP53 Arg72Pro polymorphism on skin cancer predisposition, with opposing results. While some studies supported that the TP53 Arg72Pro polymorphism status was capable of modifying BCC risk (21), others did not support any association (22). However, last meta-analysis on case-control studies of TP53 Arg72Pro polymorphism and skin cancer risk reported no effect of this polymorphism on any skin cancer subtype, including the BCC subtype (23). Ramos et al. suggested that non-melanoma skin cancer in less-exposed areas may occur in individuals with decreased DNA repair capacity (24). Since the p53 72Arg form is reported to be more efficient in induction of apoptosis, and the p53 72Pro form more efficient in DNA-repair (9), we hypothesized a relation between TP53 Arg72Pro polymorphism variants, and occurrence of specific anatomical location of BCC tumors. In our population, TP53 Arg72Pro polymorphism variants had no influence on anatomical location, on relapse, or on age of onset of BCC. Thus, the results of the current study do not support the hypothesis mentioned above. However, given the limited size of each subgroup, these results should be taken cautiously, and a study specifically focused on BCCs of the less-exposed areas should be carried out for further investigations. Finally, as expected, we found a strong relation between occupational sun exposure and risk of BCC in sun-exposed areas, but not in less-exposed areas. This is consistent with 2 studies, which revealed a direct relationship between sun exposure and head/neck non-melanoma skin cancer development (25, 26). The data of this study support results indicating the important role of sun exposure in anatomical location of BCC, and suggest etiological differences between BCC in sun-exposed and less-exposed areas. In conclusion, analyzing TP53 Arg72Pro polymorphism in the Algerian population suggests that its variants could not be a risk factor for the development of BCC. Further efforts are needed to elucidate the role of the TP53 Arg72Pro polymorphism in genetic predisposition to BCC, and factors that allow this genetic predisposition in some populations. Meanwhile, we think that assessing TP53 Arg72Pro polymorphism status, in the Algerian population, is of no interest for identifying high-risk subjects for BCC. 1. Bath-Hextall F, Bong J, Perkins W, Williams H. Interventions for basal cell carcinoma of the skin: systematic review. BMJ. 2004;329(7468):705. doi: 10.1136/bmj.38219.515266.AE. [PubMed: 15364703]. [PubMed Central: PMC518891]. 2. Jackson BA. Nonmelanoma skin cancer in persons of color. Semin Cutan Med Surg. 2009;28(2):93-5. doi: 10.1016/j.sder.2009.04.010. [PubMed: 19608059]. 3. Welsh MM, Karagas MR, Applebaum KM, Spencer SK, Perry AE, Nelson HH. A role for ultraviolet radiation immunosuppression in non-melanoma skin cancer as evidenced by gene-environment interactions. Carcinogenesis. 2008;29(10):1950-4. doi: 10.1093/carcin/bgn160. [PubMed: 18641401]. [PubMed Central: PMC2556967]. 4. Basset-Seguin N, Moles JP, Mils V, Dereure O, Guilhou JJ. TP53 tumor suppressor gene and skin carcinogenesis. J Invest Dermatol. 1994;103(5 Suppl):102S-6S. [PubMed: 7963669]. 5. Sherr CJ. Principles of tumor suppression. Cell. 2004;116(2):235-46. [PubMed: 14744434]. 6. Green DR, Kroemer G. Cytoplasmic functions of the tumour suppressor p53. Nature. 2009;458(7242):1127-30. doi: 10.1038/nature07986. [PubMed: 19407794]. [PubMed Central: PMC2814168]. 7. Whibley C, Pharoah PD, Hollstein M. p53 polymorphisms: cancer implications. Nat Rev Cancer. 2009;9(2):95-107. doi: 10.1038/nrc2584. [PubMed: 19165225]. 8. Dumont P, Leu JI, Della Pietra A3, George DL, Murphy M. The codon 72 polymorphic variants of p53 have markedly different apoptotic potential. Nat Genet. 2003;33(3):357-65. doi: 10.1038/ng1093. [PubMed: 12567188]. 9. Thomas M, Kalita A, Labrecque S, Pim D, Banks L, Matlashewski G. Two polymorphic variants of wild-type p53 differ biochemically and biologically. Mol Cell Biol. 1999;19(2):1092-100. [PubMed: 9891044]. [PubMed Central: PMC116039]. 10. Stefanaki I, Stratigos AJ, Dimisianos G, Nikolaou V, Papadopoulos O, Polydorou D, et al. p53 codon 72 Pro homozygosity increases the risk of cutaneous melanoma in individuals with dark skin complexion and among noncarriers of melanocortin 1 receptor red hair variants. Br J Dermatol. 2007;156(2):357-62. doi: 10.1111/j.1365-2133.2006.07645.x. [PubMed: 17223878]. 11. Katkoori VR, Jia X, Shanmugam C, Wan W, Meleth S, Bumpers H, et al. Prognostic significance of p53 codon 72 polymorphism differs with race in colorectal adenocarcinoma. Clin Cancer Res. 2009;15(7):2406-16. doi: 10.1158/1078-0432.CCR-08-1719. [PubMed: 19339276]. [PubMed Central: PMC3635077]. 12. Miller SA, Dykes DD, Polesky HF. A simple salting out procedure for extracting DNA from human nucleated cells. Nucleic Acids Res. 1988;16(3):1215. [PubMed: 3344216]. [PubMed Central: PMC334765]. 13. Corpet F. Multiple sequence alignment with hierarchical clustering. Nucleic Acids Res. 1988;16(22):10881-90. [PubMed: 2849754]. [PubMed Central: PMC338945]. 14. Matlashewski GJ, Tuck S, Pim D, Lamb P, Schneider J, Crawford LV. Primary structure polymorphism at amino acid residue 72 of human p53. Mol Cell Biol. 1987;7(2):961-3. [PubMed: 3547088]. [PubMed Central: PMC365159]. 15. Mabrouk I, Baccouche S, El-Abed R, Mokdad-Gargouri R, Mosbah A, Said S, et al. No evidence of correlation between p53 codon 72 polymorphism and risk of bladder or breast carcinoma in Tunisian patients. Ann N Y Acad Sci. 2003;1010:764-70. [PubMed: 15033824]. 16. Zehbe I, Voglino G, Wilander E, Genta F, Tommasino M. Codon 72 polymorphism of p53 and its association with cervical cancer. Lancet. 1999;354(9174):218-9. doi: 10.1016/S0140-6736(99)01914-5. [PubMed: 10421306]. 17. Noma C, Miyoshi Y, Taguchi T, Tamaki Y, Noguchi S. Association of p53 genetic polymorphism (Arg72Pro) with estrogen receptor positive breast cancer risk in Japanese women. Cancer Lett. 2004;210(2):197-203. doi: 10.1016/j.canlet.2004.03.031. [PubMed: 15183535]. 18. Pegoraro R, Moodley J, Naiker S, Lanning P, Rom L. The p53 codon 72 polymorphism in black South African women and the risk of cervical cancer. BJOG. 2000;107(9):1164-5. [PubMed: 11002963]. 19. Tornesello ML, Biryahwaho B, Downing R, Hatzakis A, Alessi E, Cusini M, et al. TP53 codon 72 polymorphism in classic, endemic and epidemic Kaposi's sarcoma in African and Caucasian patients. Oncology. 2009;77(5):328-34. doi: 10.1159/000260905. [PubMed: 19940524]. 20. Peixoto Guimaraes D, Hsin Lu S, Snijders P, Wilmotte R, Herrero R, Lenoir G, et al. Absence of association between HPV DNA, TP53 codon 72 polymorphism, and risk of oesophageal cancer in a high-risk area of China. Cancer Lett. 2001;162(2):231-5. [PubMed: 11146230]. 21. Dokianakis DN, Spandidos DA. P53 codon 72 polymorphism as a risk factor in the development of HPV-associated cervical cancer. Mol Cell Biol Res Commun. 2000;3(2):111-4. doi: 10.1006/mcbr.2000.0196. [PubMed: 10775508]. 22. Bendesky A, Rosales A, Salazar AM, Sordo M, Peniche J, Ostrosky-Wegman P. p53 codon 72 polymorphism, DNA damage and repair, and risk of non-melanoma skin cancer. Mutat Res. 2007;619(1-2):38-44. doi: 10.1016/j.mrfmmm.2007.01.001. [PubMed: 17403527]. 23. Jiang DK, Wang WZ, Ren WH, Yao L, Peng B, Yu L. TP53 Arg72Pro polymorphism and skin cancer risk: a meta-analysis. J Invest Dermatol. 2011;131(1):220-8. doi: 10.1038/jid.2010.270. [PubMed: 20861852]. 24. Ramos J, Villa J, Ruiz A, Armstrong R, Matta J. UV dose determines key characteristics of nonmelanoma skin cancer. Cancer Epidemiol Biomarkers Prev. 2004;13(12):2006-11. [PubMed: 15598755]. 25. Benjamin CL, Ananthaswamy HN. p53 and the pathogenesis of skin cancer. Toxicol Appl Pharmacol. 2007;224(3):241-8. doi: 10.1016/j.taap.2006.12.006. [PubMed: 17270229]. [PubMed Central: PMC2080850]. 26. Benjamin CL, Melnikova VO, Ananthaswamy HN. P53 protein and pathogenesis of melanoma and nonmelanoma skin cancer. Adv Exp Med Biol. 2008;624:265-82. doi: 10.1007/978-0-387-77574-6_21. [PubMed: 18348463].